Offshoring has a bad reputation. As a result, most businesses may not properly explore the opportunities it presents. Yet the business case for designing services that can be delivered remotely regardless of geography is clear: it will create more highly skilled, high-wage jobs for Australians. If offshoring succeeds, Australia prospers. If opposition to offshoring succeeds, that prosperity may be lost. Being opposed to importing services through offshoring is like being opposed to imports. That would leave Australians unable to watch foreign movies or TV shows (or, for that matter, unable to watch TVs, travel overseas, or drive small cars). The opportunities for offshoring are improving fast.New technologies have made offshoring easier and enabled a broader range of services to be provided seamlessly from other countries, at a much lower labour cost than with a domestic workforce. These capabilitiesprovide even more compelling economic grounds to look for workers offshore. Offshoring has helped businesses in developed economies to solve skill shortages since the early 1990s, when Y2K remediation work was sent to low-cost destinations such as India, Ireland, Israel and the Philippines. Today, offshoring is recognised as a proven strategy across many industry sectors including auditing, banking, finance, IT and medical diagnostics. • Continued upward movement of relatively high wages for onshore work, offering local staff higher-skilled, higher-wage occupations. Offshoring is also widely used in the engineering, energy and resources sectors to provide valuable skills to support rapid growth and expansion. Examples in the Western Australian market include sourcing engineering skills for significant energy and resources projects from the United Kingdom and a noticeable increase in the amount of offshore pre-fabrication of oil and gas capital projects. As we move lower-paid jobs offshore, we can expect Australia’s economic performance to improve, freeing up Australian workers to do higher-paying jobs and lowering costs to business, and ultimately to consumers. The economic benefits of offshoring become even more attractive to business as education levels in China, India and other offshoring hubs quickly improve, better meeting our demands for services and support. In addition, the number of available workers in countries such as India will grow much faster in the coming decade than anywhere else (see overleaf). This will provide a willing talent pool of educated individuals who can export services to Australia. • Grow by 133 million in India. Australian businesses must urgently assess what work they can offshore to maintain and enhance their global competitiveness. By doing so, they will also boost pay and opportunities across their workforce. Offshoring offers particularly significant opportunities for rapidly expanding or emerging industries. For example, the anticipated arrival of carbon pricing means the Australian energy sector will need to make major decisions in relatively tight timeframes on retiring brown coal power stations in Victoria’s Latrobe Valley. Organisations conducting techno-economic studies to assess the ramifications of these decisions could leverage talent in Indian power engineering schools by offshoring this research. Drawing on such talent pools to make better informed decisions could provide significant long-term benefits to all Australians. Government needs to provide responsible leadership in the offshoring debate. The wider public sees offshoring as a threat: stealing jobs from Australians. 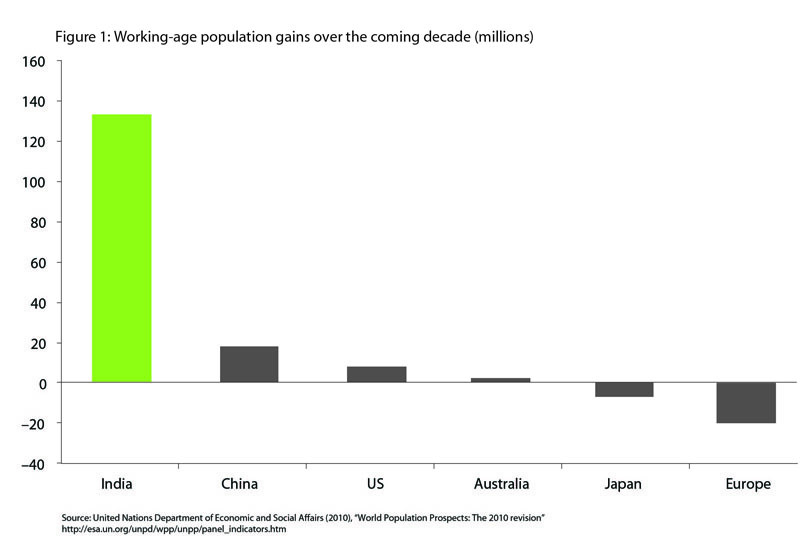 Yet the problem in Australia in coming years won’t be a lack of jobs – it will be a lack of workers. Instead, the Australian Governments must emphasise that Australia needs workers to foster growth and that offshoring is a positive and productive way to find workers who can achieve economic benefits and enhance productivity for Australia. In fact, by offshoring low-skill tasks, we free up Australian workers to earn higher incomes. This policy could also include proactive efforts to build higher skill sectors, as Andrew Liveris – the Australian born Chairman and CEO of The Dow Chemical Company has called for. The more that government and political leaders can take a positive stand on this issue and explain to the electorate that their fears about offshoring are misplaced, the greater the prosperity Australia can achieve in the face of increasing skill shortages over the coming years. It can take several years to prepare and successfully execute offshoring programs. Smart business managers will develop offshoring strategies, even if they have not yet decided to transfer work offshore. Offshoring works best for companies with well-documented, mature processes that can easily be migrated to an external provider, with minimal risk to business continuity. However, to cut the complexity and cost of offshoring many organisations must first transform their systems and processes. Companies need to thoroughly analyse processes and people structures to evaluate which roles don’t need a physical presence in Australia. This analysis can have unexpected benefits as it exposes existing inefficiencies and provides cost savings even before a business decides to try offshoring. • How will you ensure your organisation is aware of offshoring opportunities? • What are you doing to help your people think creatively about offshoring? How could it transform your business or your people model? • What level of access and connections to offshoring countries are necessary for you to explore offshoring options? • How are you calculating the short-term and long-term costs and benefits of offshoring (including the tangible andintangible) impacts? • How will currency fluctuations and exchange rates change your appetite for offshoring? How easily could you change your strategy in response? • What impact would offshoring have on your staff’s learning and leadership development?